To begin corrosion testing, two raised-face FRP piping flange assemblies were delivered to ITI Anti-Corrision, Inc. for exposure to 2200±24 hours of ASTM B 117-03; Standard practice for operating salt spray (fog) apparatus. The nuts/bolts/washers used on each assembly were coated with the Fluorokote #1® system. 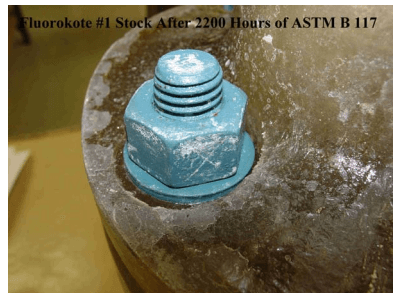 The assemblies were visually examined for corrosion (ASTM D 610-01) at 1200±24 hours, 1800±24 hours, 2000±24 hours, with the full/final evaluations performed at 2200±24 hours. The Horizontal/Hand Torque assembly was dissembled at the completion of the exposure with the nuts being easily unthreaded by hand with little effort.